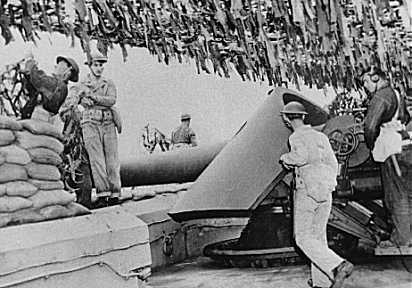 The gun crew practices ramming powder bags into the breech of a 12-inch disappearing gun of Battery Mendell at Fort Barry, north of the Gate. Beyond this position are the cliffs of Point Bonita. For rare COLOR action shots of this battery, click here! 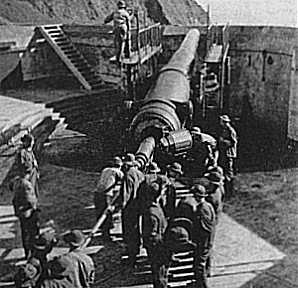 Secondary batteries, like this 6-inch gun of Battery Chamberlain on Baker Beach in San Francisco, fired on the submarine minefields off the harbor entrance. 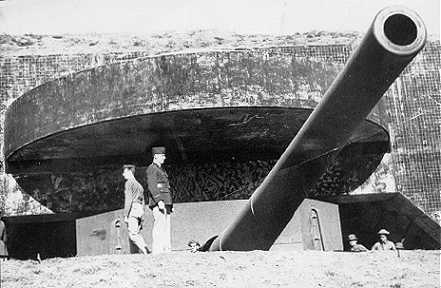 During the 1940's Baker Beach was heavily fortified with several gun batteries and numerous fighting positions. Click here for more on this battery.